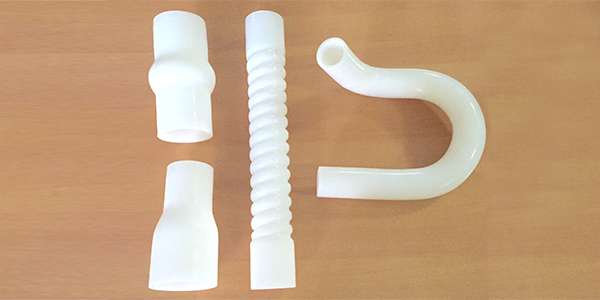 Food grade silicone are made with Platinum cured silicone and have a very low glass transition temperatures. They are transparent, and hence one can see through to the fabric reinforcement. Food grade silicones show excellent heat resistance, cold flexibility, dielectric properties and especially good resistance to weather, ozone and UV rays. Food grade silicone formulations are designed specifically for use with food products. FDA approved silicone has reduced food taint and very low bacteria build up resulting in ultimately lower maintenance costs. The temperature range is between -50 °C +180 °C. Food grade silicone are be reinforced with multiple plies of knit polyester; and wire too if needed, to withstand different pressure levels.